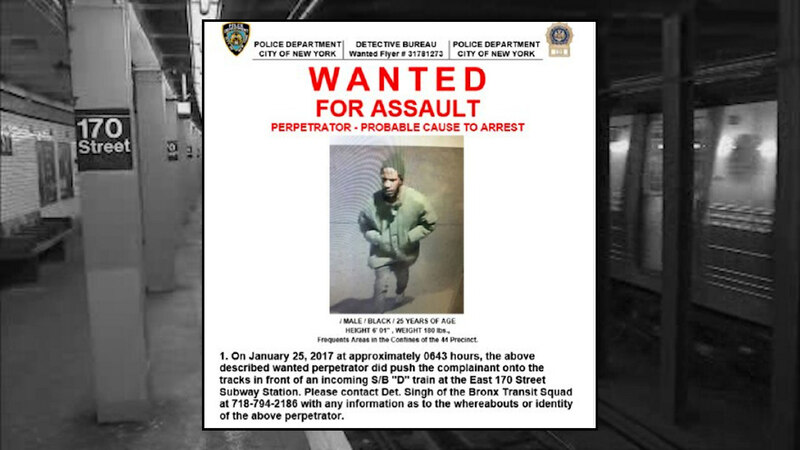 BRONX (WABC) -- Police are looking for the suspect who shoved a man onto the subway tracks where he was struck by a train, in a terrifying attack at a Bronx station Wednesday morning. The NYPD released a surveillance photo of the suspect they are searching for. Police say he shoved another man into the path of an oncoming train at the 170th Street station. Fire officials say the 43-year-old victim was forced to dodge the oncoming train, but one of his legs was run over, leaving him bleeding profusely just inches from the electrified third rail. Paramedics rushed to the scene and found the man in and out of consciousness while at serious risk of bleeding to death. He was rushed to Lincoln Hospital, where he remains in stable condition. Police say the victim and his assailant fought on the platform before he was shoved onto the tracks. The suspect is described as a man in his mid-20s who was wearing a green jacket.